Sign up online to get a coupon for 20% off your entire purchase. Or visit store in person 11/23 from 6am - 12noon to get coupon. 20% off coupon valid Friday, November 23. 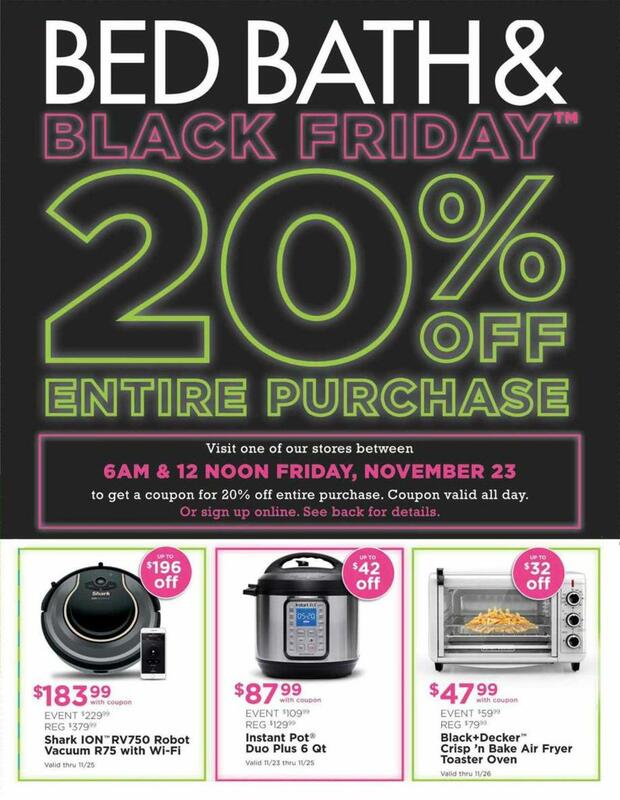 On Black Friday, Bed Bath & Beyond is offering some of the biggest sales of the year. Look for extreme savings on vacuums, kitchenware, linens, and appliances. Online shoppers get early access to sale prices, starting on Thanksgiving Day. Although stores are closed on Thanksgiving, shoppers can get an early start on Friday, Nov. 23 when doors open at 6am. In addition, shoppers can get additional discounts on top of the Black Friday deals by applying regularly mailed coupons toward applicable merchandise.